Very excited about this one... I contacted Frank from the always great Voodoofunk blog about doing a Live at Home mix. It turned out that he was on his way to Africa, but he had a mix for his new night "Lagos Disco Inferno" that needed a home...Needless to say, I extended our site. 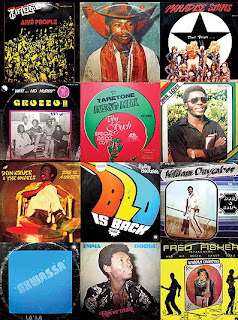 Nigeria in the 70s had a recording industry that most foreigners cannot begin to comprehend.Hundreds of Funk and Disco bands recorded for big companies like EMI, Decca, Polydor, and an uncountable number of independent labels. Yet this incredibly vibrant scene remained ignored by everybody outside of West Africa. Until now: "Lagos Disco Inferno" is the only club night on earth devoted to spreading the power of Nigerian Disco music! It's time to face the heat and to fully submit ourselves to some of the heaviest grooves ever created by mankind. Lets get together and celebrate the heroes of a time and place beyond the things we know. This mix is solid as ever. I need to find this old African Disco comp I got maybe 10 years ago. GREAT MIX!!! The Boogie Trip link doesn't work for me. ??? Are you trying to download?? send direct email if you still have an issue. word up brotha for da love of LA MUSICAA !!!! hope u keep on finding hidden gems.. This mix is so sweet! Nigerian disco is the way to go! You can not supply use such a great mix without giving us the name of the songs, titles, artists. Just peeping this now and it's awesome!!!! can't wait for the comp. This is a nice information shared here. Thank you for sharing this.